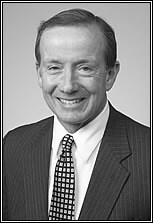 Robert Leonard joined the firm in 1976, after four years as a captain in the Air Force Judge Advocate General’s Corps. He specializes in civil trial work, with an emphasis on employment-related litigation, including discrimination, trade secrets, wage and ERISA issues. He regularly lectures on employment issues at continuing education and business seminars. Robert is a director of the Springfield Prep Charter School and has been a director of the Springfield Public Forum, the president of United Cerebral Palsy, a member of the Longmeadow School Committee, and chairman of the Longmeadow Zoning Board of Appeals.